Nominated for the 2015 Spiel des Jahres award. Machi Koro is a fast-paced, dice-rolling city builder. in the game, players compete to be the first person to build up their simple village into a sprawling metropolis. 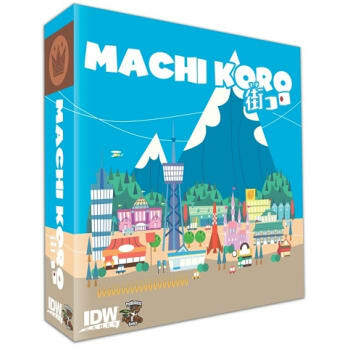 Originally designed and released in Japan, Machi Koro has developed a dedicated fan-base around the world. Excited fans have been eagerly anticipating an English translation, and the game has already garnered a "seal of excellence" from The Dice Tower among many other accolades. Armed only with your trusty die and a dream, you must grow Machi Koro into the largest city in the region. You will need to collect income from developments and build public works, and steal from your neighbors coffers. Just make sure they aren't doing the same to you! Machi Koro is a fast-paced light-hearted game for you and up to 3 friends. They say you can't build Rome in a day, but Machi Koro will can be built in under 30 minutes!